the little headstones always make me melancholy. This one was broken and lying rather haphazardly in the leaves between two larger stones in a much older section of the graveyard we visited this weekend. I did not get the sense that any of the three were related, alas. Someone was obviously loved, but I wonder, where did Darling’s people go? I am taking some flowers to Darling this week. I don’t actually know who he or she was, but figure that it is good to be remembered. This entry was posted in Family Life and tagged photography. Bookmark the permalink. 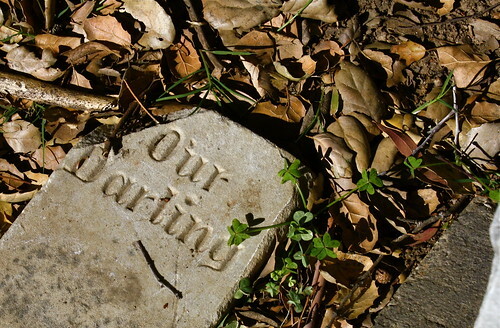 I’ve gotten attached to little tombstones, too… always a little heartwrenching to see the tiny ones. I miss you too! Are you on Facebook? I find I’m just doing a lot less blogging of the intensely personal sort that I used to do over on LJ. It isn’t that stuff isn’t going on, it’s just, the way I talk about it has changed. I should really go check in on my friends there more, though. We are fine. I am fine. The girls are thriving and I am so in love with that man. Life is… complex and changing and scary and wonderful. How are you and R and the girls? I should go catch up.